BEL - good offer LED bulb E10 1,2W. 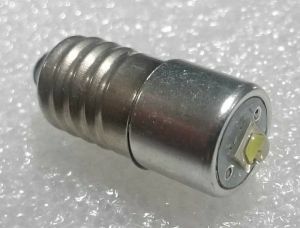 LED bulb with Edison thread E10 is designed as bulb replacement to flashlights. LED bulb has white light. Supply voltage is 1.5 to 9 V (minus on thread), input power is from 0.58 to 1.33 W in according to supply voltage. Flaring angle 120 degrees. Quantity discounts: over 9 pcs - 10 %. Your question LED bulb E10 1,2W.